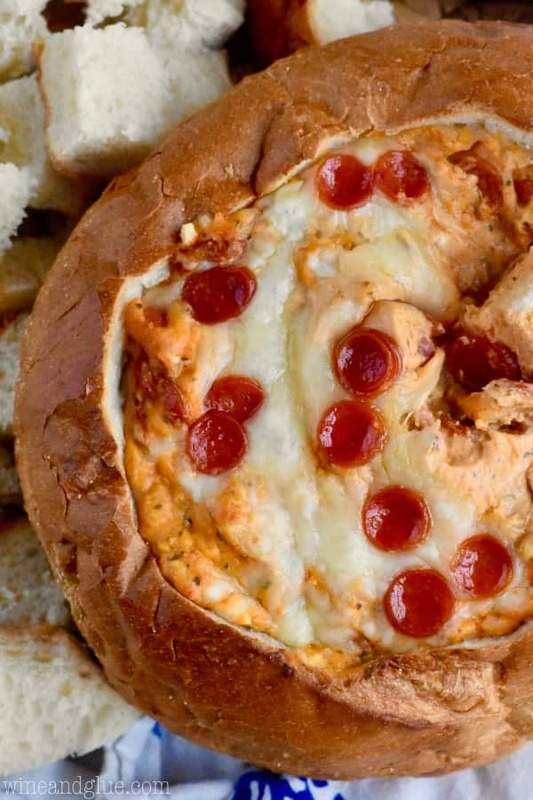 This Bread Bowl Pizza Dip comes together so easily, and is a deliciously perfect appetizer! Is anyone else ready to just sign off of Facebook for good? I mean . . . I get it. It’s great for keeping up with friends and family, and for me, it’s a major part of running my business . . . but for love of Zuckerberg, it’s getting nuts on there, friends. Am I the only one who just wants to look at videos of cats? 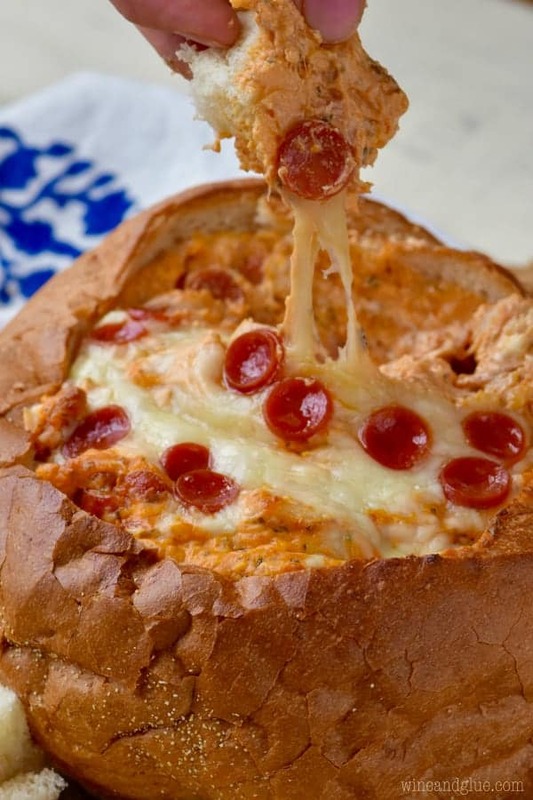 So in the spirit of ignoring the real issues in our world, can we talk about this Bread Bowl Pizza Dip?? Guys. 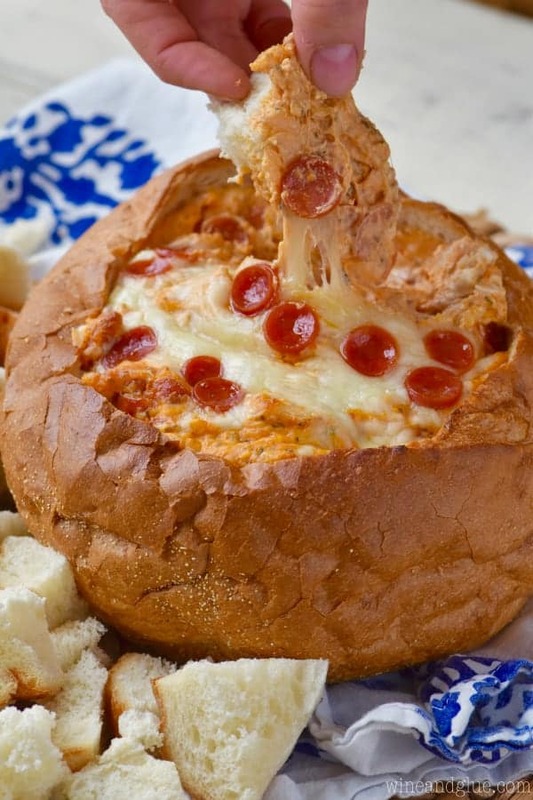 It’s Pizza Dip IN a Bread Bowl!! This guy is so super easy to throw together. 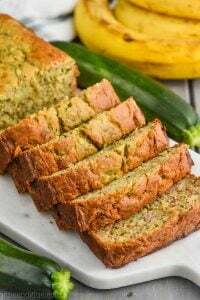 It’s blend all the ingredients, cut out the center of the bread (cut it up for serving), throw all the goodness inside the bread and bake it. YUMMY! 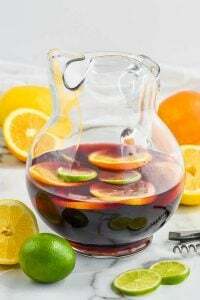 It is guaranteed to make you forget things you want to forget, like politics, lack of cute cat videos, and being on a juice diet (don’t ask). 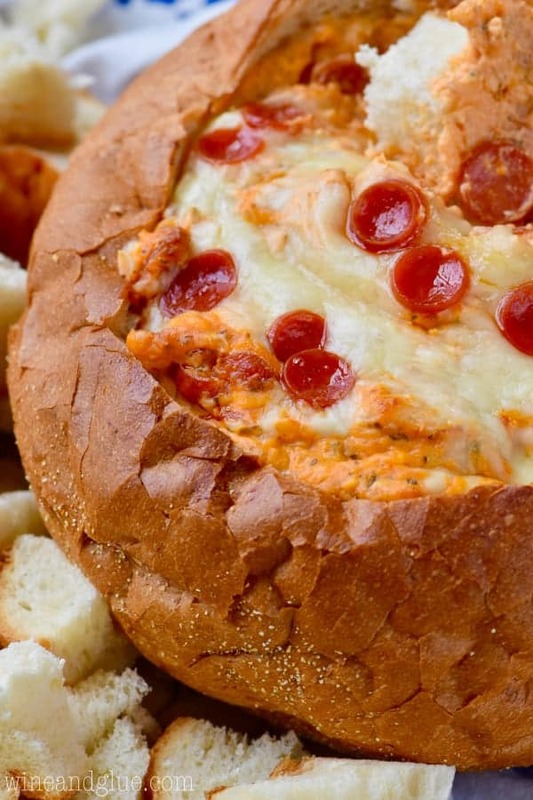 In a large bowl, mix together the cream cheese, 1/2 cup of mozzarella cheese, parmesan cheese, oregano, basil, garlic salt, pizza sauce, and mini pepperoni. Using a serrated knife, cut out the middle of the round loaf of bread, like you would do to make a bread bowl for soup. Cut the part of the bread that you removed up into cubes and reserve for serving. Put the cream cheese mixture into the loaf of bread. Top with the remaining mozzarella cheese and then some mini pepperoni. 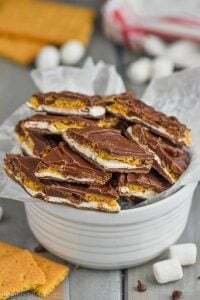 Cover with aluminum foil and place directly on the oven rack. Bake for 20 minutes. Uncover and bake for a remaining 10 minutes. 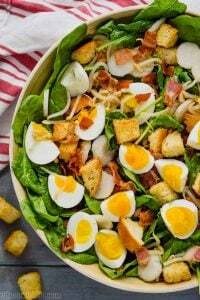 Serve immediately with the reserved bread and bruschetta chips. Is anyone else ready to just sign off of Facebook for good? <— I was literally about to cry last night reading all the hatred, rants, and venom spewing from people. So I poured a glass or three of champagne and ate cheese 🙂 This pizza dip would have been even better! Right? I don’t understand how people can speak so unkindly to one another over differences in opinions. Even with the differences in opinions are over such important issues. My goodness, that’s too bad. Why can’t we all live by the Golden Rule or listen to Thumper’s mom? YES OMG. There is this Emergency Kitten video on Twitter I’ve been watching over and over wanting to share in on FB to make people happy again. Also: THIS CHEESE!